Just enter your Name and Email Address to recieve The Clear Lake Report filled with endless amounts of useful information that will help you to catch bigger fish more often! 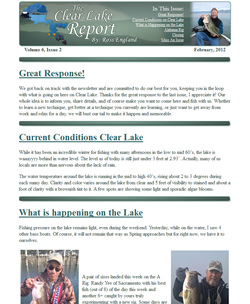 Click on the Newsletter image on the right to view a sample Clear Lake Report Issue. View our past issues on our Clear Lake Fishing Report Index .